Point of View is how we see things, how we look at ideas, at each other, at the world. When we’re thinking about thinking with the Elements of Thought, it’s generally best to start from Point of View. 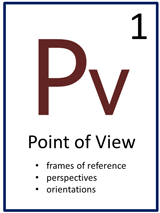 With Point of View, we look at Frames of Reference, Perspectives, and Orientations. First, frames of reference. A frame forces us to look at a part of the world, and our understanding of the world. It tends to limit what we know and understand. We see the same things, but we see them differently. Second, we look at perspectives: What is our slant on things? What is the other person’s slant on things? How do they look at life from their particular perspective? Third, orientations: Where have you been? Where are you coming from? Where are you headed? How does your orientation effect your Point of View? It is important to remember that Point of View is generally consistent and does not change easily. It is a reflection of who people are inside, what they use to make their assumptions and their decisions. After you have noted Point of View, which Element of Thought should you look at next? Well, any one that you feel you can fill in. It’s your choice. Go for what you have at hand, and then your search for what you don’t know begins. Point of View is a person’s most basic beliefs, values, and biases. It is who you are and how you look…at the universe.